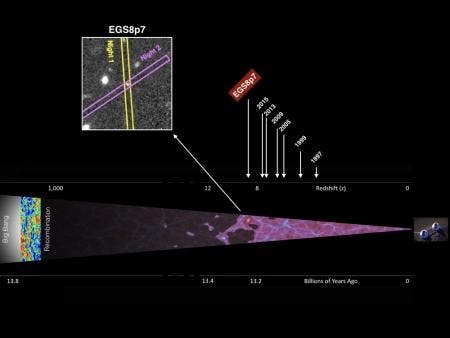 A team of Caltech researchers that has spent years searching for the earliest objects in the universe now reports the detection of what may be the most distant galaxy ever found. 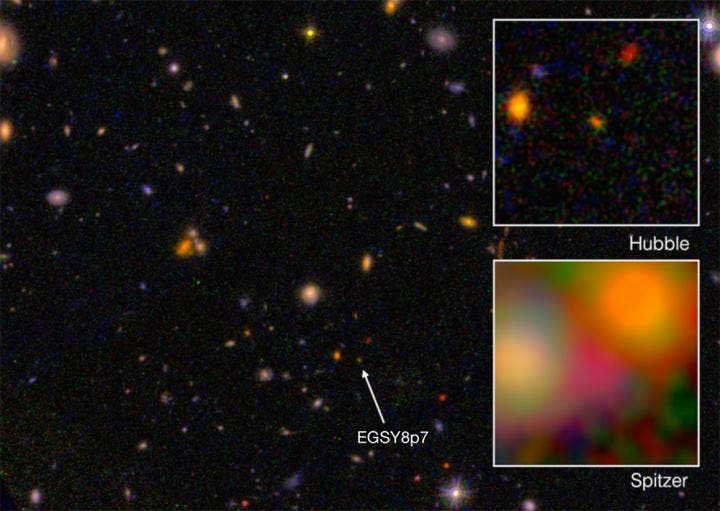 In an article published August 28, 2015 in Astrophysical Journal Letters, Adi Zitrin, a NASA Hubble Postdoctoral Scholar in Astronomy, and Richard Ellis–who recently retired after 15 years on the Caltech faculty and is now a professor of astrophysics at University College, London–describe evidence for a galaxy called EGS8p7 that is more than 13.2 billion years old. The universe itself is about 13.8 billion years old. Redshift is traditionally used to measure distance to galaxies, but is difficult to determine when looking at the universe's most distant–and thus earliest–objects. Immediately after the Big Bang, the universe was a soup of charged particles–electrons and protons–and light (photons). Because these photons were scattered by free electrons, the early universe could not transmit light. By 380,000 years after the Big Bang, the universe had cooled enough for free electrons and protons to combine into neutral hydrogen atoms that filled the universe, allowing light to travel through the cosmos. Then, when the universe was just a half-billion to a billion years old, the first galaxies turned on and reionized the neutral gas. The universe remains ionized today. Prior to reionization, however, clouds of neutral hydrogen atoms would have absorbed certain radiation emitted by young, newly forming galaxies–including the so-called Lyman-alpha line, the spectral signature of hot hydrogen gas that has been heated by ultraviolet emission from new stars, and a commonly used indicator of star formation. A graphic representation below of the extreme distance of galaxy EGS8p7. To the far right is the W. M. Keck telescope used for the observation, to the far left is the Big Bang, and at the center is the galaxy. The scale above indicates the progression of ever more distant discoveries and the corresponding year, and at the bottom is a time scale equivalent to distance. Finally, the inset to top left charts the observations made across two nights with the MOSFIRE spectrometer that resulted in the detection. (Adi Zitrin/ Caltech).